To see wild horses roaming free across the rolling green hills of California makes me smile. There is a long standing battle taking place to save the herds of wild horses emblematic of the American west from the slaughter house. Presently, fifty-thousand horses are being held in Bureau of land Management holding pens awaiting their futures. Sadly, they will most likely be destroyed if an answer to their dilemma does not come soon. 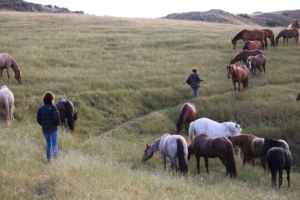 The Return to Freedom organization with two central California locations, one in Lompoc and one on a 300 acre ranch in San Luis Obispo give safe harbor to 400 wild horses. You can see from this video that they have a good life, are fit and roaming free in this bucolic setting. Hart Mountain herd from Return to Freedom on Vimeo. The plight of the wild mustangs in America is not new. The cattlemen want the range land owned by the government for their stock. The Bureau of Land Management contend that the wild herds are over-grazing federal lands and must be culled. They continue to use helicopters to round up thousands of horses each year. 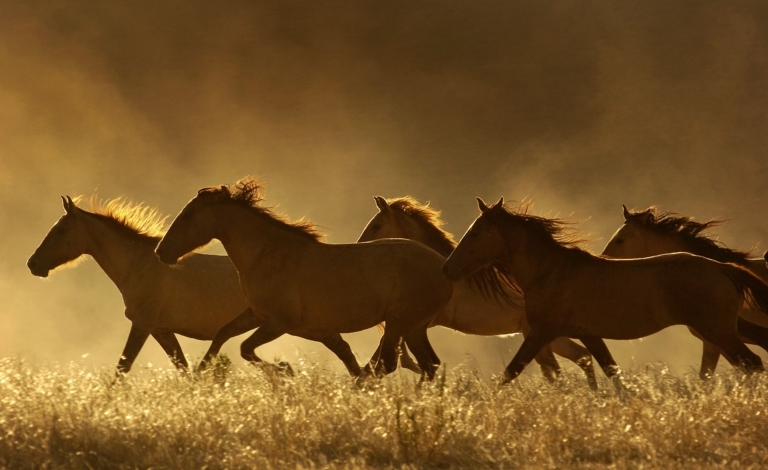 Only 32,000 wild horses out of the 2 million that once roamed the west remain. Meanwhile, the battle in congress to pass a bill that would protect the herds and provide a budget to handle the situation humanely continues. Return to Freedom is a non-profit organization provides some fun and informative ways for you to support the cause. They offer a docent guided walking tour of the sanctuary with some time for quiet observation of the herd. 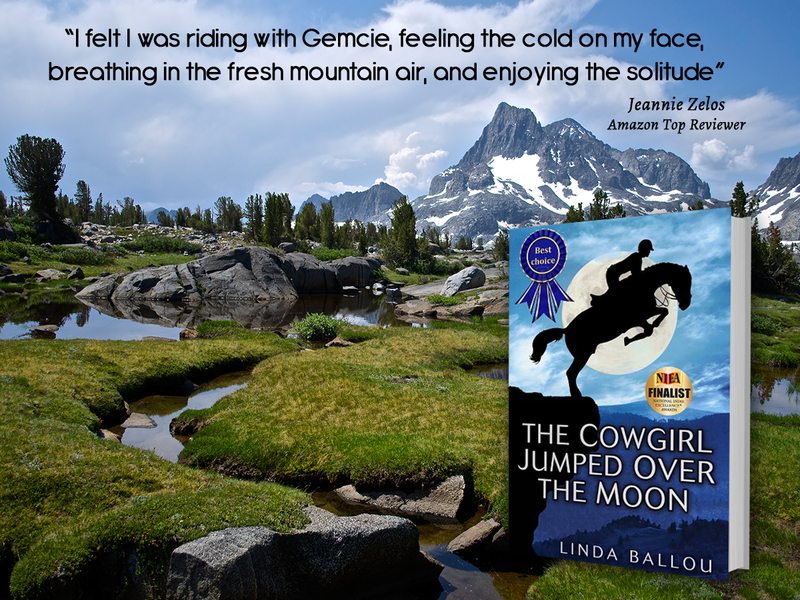 You will meet some of the mustangs that live there and learn about the horses as a native species with it’s origins in American history. 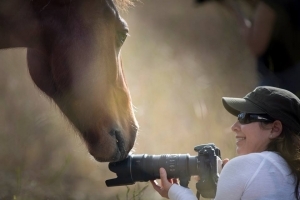 On 2,000 acres of horse heaven in Central Coastal California, 70 wild horses and 16 burros roam free. Safaris last 3 hours and can be scheduled for early morning or late afternoon. Picnic basket with healthy snacks and light meal provided – end your Photo Safari with a pre-arranged picnic lunch or dinner in the hills with mountain top views to the sea! On the Return to Freedom site under “Issues” tab you can sign a petition to let your representatives know that you care about the future of the wild herds, or you can simply donate funds to this very worthy cause. Visit the www.returntofreedom for more information. 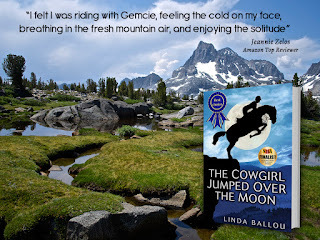 Linda Ballou is the author of the Cowgirl Jumped Over the Moon.